What is Daylight Savings Time? Daylight Savings Time, commonly referred to as daylight savings, is the practice of setting clocks forward one hour in the summer and then one hour back again in the fall. A simple way to remember the practice is summed up in the phrase, “spring forward, fall back.” If you grew up in a hemisphere that practices Daylight Savings, this is nothing new. However, fewer than 40% of countries in the world practice Daylight Savings. The practice occurs so that we can supposedly make better use of natural daylight but the difference in light is most recognizable in areas that are a specific distance from the equator. While we understand the concept, our brain’s usually do not. Once you set your clocks back in the fall, it is very easy for your circadian rhythm to get thrown off. It’s pretty difficult to feel balanced and energized when the sun sets at 4:30 pm. Our brains are very perceptive when it comes to sunlight. Darkness means more melatonin being released. This can be a slippery slope. How Can Light Therapy Help? Being affected by seasonal changes such as Daylight Savings Time is a condition called Seasonal Affective Disorder, or SAD. As we mentioned earlier, our brains are extremely sensitive when it comes to light. More than most people recognize, actually. Seasonal Affective Disorder is often shoved under the rug and called the “winter blues.” But why suffer when you could change it? Light therapy is the magical cure! Well, it’s not really magic – but it works so well it kind of feels that way! Light therapy practices such as the use of a light box can help keep your circadian rhythm in sync with the world around you. People suffering from SAD have a couple options for treatment when it comes to light therapy. One option is a light box. A light box provides a measured amount of light through fluorescent bulbs or panels. The light intensity is typically between 2,500 to 10,000 lux. The amount of light is different depending on what you deem necessary for your treatment. Typically, the amount of light would be equal to that of the amount of sunlight you are exposed to on a nice spring day. The light box helps regulate the internal clock in your mind, keeping your brain on track and your energy level high. The light box is typically small to medium sized, easy to carry, and fairly portable, depending on the seriousness of the depression. People undergoing the treatment set aside around 30 minutes a day, sometimes twice a day, and sit 12 to 24 inches away from the light box. You would then carry on with whatever you choose. You can read, knit, write, eat, talk on the phone, etc, while being careful not to look directly into the light. For people who have trouble waking up in the morning, have not seen results with light therapy boxes, or want to combine two methods, dawn/dusk simulators are recommended. The devices have proven effective for people with mild to severe symptoms. The dawn/dusk simulator helps mimic the ideal lighting and darkness occurring outdoors. For example, if you have trouble waking up in the morning, the simulator can be set to slowly turn on at 8 a.m., or whatever time you choose. A bright light will appear in your bedroom, typically on a bedside table. The simulator leaves you feeling refreshed and ready for the day. Another scenario would be helping keep your biological clock on time by mimicking light throughout your day and then shutting down at the accurate outdoors time. Daylight Savings Time is the number one trigger for Seasonal Affective Disorder. It’s a serious condition and can have a major effect your quality of life. Embrace light therapy. Change the stigma of daylight savings time! When it comes to using light therapy as a form of treatment, it’s best to not rule anything out. Anything is possible – the sky seems to be the limit! While light therapy is most commonly used for two things – Seasonal Affective Disorder and skin conditions (such as acne) the options really do seem to endless and everything is being studied. If something as simple as light therapy could improve your quality of life, why wouldn’t you give it a go? Way back in the early 20th century, doctors moved patients’ beds to sunny balconies as a form of treatment for psoriasis and rickets. Did you know that in 1903, a physician named Niels Finsen won the Nobel Prize for inventing a giant lamp that treats skin tuberculosis, also known as Lupus? And back in the 1920s, athletes taking part in the Olympics bathed beneath UV rays before they raced in order to boost their performance. These experts knew that the sun and man-made versions of light worked, but they were quickly pushed out of the market and replaced with electronics and medicine. While much of this push came from the fear of skin cancer due to the sun and lights, phototherapy has greatly improved in the last decade and that is no longer a concern. Light therapy is finally regaining popularity and making it’s way into people’s homes all over the world as a harm-free, all natural form of treatment for a wide array of conditions! Consumers in the U.K. actually spent over $300 million on light therapy is 2016. How remarkable is that? Future Market Insights predicts the global market to grow nearly 5% annually in the next decade. This is just the beginning! “When particles of light hit the skin, they’re absorbed by light-sensitive molecules inside cells, which kick-start a response. That response varies, depending on the wavelength, or color, of light and where it’s used. Light therapy is very commonly marketed in magazines, on websites, with retailers, etc., as a useful form of treatment for conditions such as insomnia, Seasonal Affective Disorder, acne, wrinkles, more serious skin conditions, and more. But what else can this light do? That’s what we’re here to tell you about! Skepticism is high when it comes to using light therapy for serious diseases, but Hamblin, who we discussed above, has been studying light therapy for 30 years and he is confident that with the right doses, wavelengths, and techniques, light therapy can treat disorders such as chronic pain, dementia, specific forms of cancer, severe migraines, and so much more! What we’re trying to get to here is that if you are struggling with a physical or mental condition, discuss light therapy with your doctor. You may be able to solve your problems with an inexpensive, harm-free, non-invasive form of treatment in the comfort of your home. Does it get any better than that? Tanning beds are commonly associated with anti-aging and skin rejuvenation. However, when it comes to long term effects, tanning beds are not the way to go! While they may help clear some acne, promote energy, and makes you feel tan and young, they also promote skin cancer, wrinkles and fine lines. Red light therapy can help you with anti-aging and skin rejuvenation in a harm-free and natural way that actually reduces wrinkles and fine lines, treats acne, promotes energy and vibrant skin, and so much more! Plus, red light therapy can treat chronic pain and symptoms related to it! Red Light Therapy may be the new magical elixir…except this actually works. Red Light Therapy devices can be used to help slow down our natural cosmetic aging. Treatment can reduce fine lines and wrinkles while also tightening and firming the skin. Proper treatment can ridf age spots and hyper pigmentation, which usually occurs on the face, neck, and hands. There’s no need for face lifts when you can go the natural route. Red Light Therapy can also diminish blemishes and red spots, along with acne. Thought you could never get rid of those blackheads around your nose? Or those zits that keep showing up around your chin? How about those scars that acne left you with? Regularly scheduled treatment can help you say goodbye to those. Medications always come with a large slew of side effects and everyone reacts differently. Red Light Therapy has proven to have few to no side affects while effectively treating serious conditions that people struggle with every day. Proper light treatment can be used to treat skin problems you thought you would never get to say adios to. For example, burns and scars. Over time, Red Light Therapy can treat your skin and bring it back to its once undamaged self. It can also help with more serious conditions such as Rosacea, Eczema, Athlete’s Foot, Psoriasis, and more. If you are currently taking medication for any of these conditions or similar ones, it may be worth discussing Red Light Therapy with your doctor and finding a better option for your body. It probably goes without asking, but who wants to take pain killers every day? They’re dangerous and make your stomach a wreck. An even better question: who can lead a happy life when living with chronic pain? The answer is no one. Red Light Therapy is very commonly used for pain relief. It’s used in doctor’s offices all over. Athletes swear by it, chiropractor’s praise it, and it’ll be hard to find someone with a negative opinion on the matter. It’s gentle, drug-free, non-invasive, and 100% awesome. In most cases, it has proven extremely effective in reducing pains and aches. In some cases, Red Light Therapy has actually totally eliminated aches and pains. Red Light Therapy can treat herniated and bulging disks, muscle related back pain, osteoarthritis, pulled and strained muscles, Fibromyalgia, muscle spasms, inflammation, bone fractures, chips, and sprains, nerve injuries, neck pain, neck stiffness, and more. Red Light Therapy can be used in a few different forms. The first decision that needs to be made is whether treatment is preferred at home or not. This answer can rely on the severity of the condition, budget, or what is being treated on the body. If possible, it will be easier and more cost effective to perform light therapy treatments at home. Doctor’s office light therapy sessions can be expensive as well as difficult to work into a daily schedule. If Red Light Therapy treatments are done at home, you can do them at your own convenience, have a one-time cost, and be performed as many times as deemed necessary. There are hand held devices that are great for treating acne. There are also pads and wraps that are great for muscle and joint relief. If space isn’t an issue, there are large panels that can be used to treat a vast area on the body. Tanning salons have recently undergone major criticism, making them frowned upon and practically irrelevant in the past few years. The salons have caught up with the times and many of them have been replacing the bulbs in their tanning beds with proper Red Light Therapy bulbs. If you are looking for an all over body treatment, this may be a good option for you. It won’t be very cost effective, but lying on a bed once a week for a set amount of time could help reduce body acne, cellulite, wrinkles, etc. It can also help with aching muscles, severe conditions such as Fibromyalgia, arthritis, and more. As for chronic pain and muscle and joint relief, infrared light is always used. This form of light penetrates deeper into the body and repairs cell components. The light also increases the production of endorphins. This blocks the chemicals that transmit pain. If you’re using an at-home treatment, the infrared light typically penetrates the skin at 880 nanometers at a depth of 30-40 millimeters. Devices or beds in doctors’ offices will likely be stronger because they can be more controlled. As you can most likely tell by now, we’re very much into light therapy. We’re strong believers in the theory that it can treat just about anything that you don’t want in your mind or body. Light therapy is commonly used for a wide array of conditions and disorders, from cancer, to depression, to acne. Because the scope of what light therapy can treat is quite large, there are many different forms of treatment. There are many different devices, schedules, and factors to consider before beginning treatment. We have narrowed all of these factors down to 3 key elements: duration, timing, and intensity. These elements will exist regardless of the condition or disorder that you are attempting to treat – so listen close! The duration of the light therapy treatments refers to how long the treatment is conducted and the scheduling of it. This can range from once a week for two months all the way to five days a week for a year depending on the condition. The timing of the light therapy treatment refers to how long the treatment is conducted. For example, sitting in front of light box for 30 minutes, or keeping a body wrap around the back for 15 minutes. The intensity of light therapy treatments refers to the power of the light therapy device being used. For example, using a light box with 10,000 lux in order to treat seasonal depression. When these three key elements are accurately combined, the world of light therapy will open up to you. The treatment’s potential will be endless and you will find yourself on a path to a happier and healthier life. Seasonal Affective Disorder is a form of depression that occurs each year during the fall and winter. The depression occurs due to the lack of sunlight as well as day light savings. These tough months can seriously affect our circadian rhythm, which is the internal clock inside our brains. Normal depression, which can occurs during any of the 12 months of the year, is also very sensitive to light. Using a light box in a situation such as this has been proven extremely effective. If someone is struggling with Seasonal Affective Disorder, a light box will lift their mood and remind their brain what time of day it is in order to keep mood levels high. If someone is struggling with depression, a light box can help by effectively elevating the chemicals in the brain that make us feel low. After much research, the ideal light boxes have been created to fit individual’s lifestyles. Light boxes come in all different shapes and sizes as well as different intensity levels. The method of treatment may vary depending on the severity of the seasonal depression as well as the device being used. The stronger the light, the less time should be spent in front of the light box. Most people use light boxes for a minimum of 30 minutes each morning. A morning treatment can start your day off right and keep your body’s internal clock in check. However, some people don’t have time in the morning and choose to do the treatment at a different time. This is okay, too. The more effectively you can fit the treatment into your schedule, the more you will benefit from it. Below is a list of light sources and how much light we receive indoors versus outdoors. Also, note that lux is a standard unit of light flow. Outdoors on a sunny day is 50-100 times brighter than office or room lighting. With that being said, most light boxes are around 10,000 lux. It’s important to keep cost in mind as well. The higher intensity of the device, the more expensive it is going to be. However, if Seasonal Affective Disorder or depression are controlling your life, cost becomes less important, don’t you think? Dawn simulators have also been proven extremely effective in scenarios such Seasonal Affective Disorder and depression and they are noticeably cheaper than light boxes. A dawn simulator mimics the sunrise and sunset in your home through a small lamp. A timer must be set and when it’s time for you to start waking up, the simulator will turn on, mimicking the sunrise. This can be left on throughout the day and then slowly shut off as your day winds down. Most people only use the simulator to wake up, acting as an alarm clock. But for people working from home or spending a lot of time in their home during the fall and winter months, it may be effective and helpful to leave the simulator on throughout the day. Light boxes and dawn simulators are also extremely effective when it comes to mood disorders such as insomnia and jet lag. Seasonal changes, depression, medications, and stress, can all trigger insomnia. And for people who travel a lot for work or pleasure, jet lag can quickly control your life. Using a dawn simulator for both of these conditions can be extremely effective. If you’re struggling with insomnia, a dawn simulator will help you wake up and go to sleep at appropriate times, helping create a proper sleep schedule and breaking insomnia. Also, because insomnia is also a side effect of depression, you could kill two birds with one stone. Using a light box could help, too. It could elevate your mood, thus decreasing your stress levels, ultimately letting you fall asleep. A dawn simulator can help fight off jet lag by keeping your body’s internal clock, or circadian rhythm in check. The simulator will help remind your brain the time of day and get you back to normal. A light box could definitely be effective too, if it is used in the morning. It will keep your brain in sync with the day, put a smile on your face and a glow on your skin. Light therapy devices are commonly used to fight acne, slow down the cosmetic aging process, and even reverse hair loss. Handheld devices are typically used for acne and usually use either red or blue light. The device uses infrared lighting to penetrate into the pores on the skin to kill the bacteria that creates acne. The devices can also reduce the inflammation on the skin. This process can be done at home or in a dermatologist’s office. However, at-home treatments are going to be far less expensive. The devices are typically held to the skin for 10 minutes increments and the light is commonly between 400 and 1,000 nanometers in intensity. Anti-aging is one of the most popular benefits of light therapy. Red light therapy is commonly use for skin rejuvenation. Treatments can reduce wrinkles, minimize fine lines, reduce cellulite markings, and leave you with a young and healthy glow. Handheld devices, similar or the same as the ones use for acne, can help achieve all of these goals. Red light therapy beds are also extremely common. Similar to a tanning bed, the person undergoing the treatment would lie in the bed for a certain amount of time on a set schedule. Typically 15 to 30 minutes one to several times a week. Hair loss is treated with red light therapy as well. Whether the hair loss is due to old age, pattern baldness, stress, or a skin condition, red light is known to help. The patient will either use a handheld device or a light panel and set a schedule for themselves. The intensity is the same at the options discussed above. Of course, for all of these things, reading instructions and taking your personal condition into account before beginning treatment will give you the best results. Light therapy can help with more serious conditions, such as rosacea, eczema, athlete’s foot, psoriasis, and more. If you are currently taking medication for any of these conditions or similar ones, it may be worth discussing red light therapy with your doctor and finding a better option for your body. The treatments won’t take over your life and can be easily fit into your daily routine. Red light therapy is used for just about all of these conditions. The same devices discussed above are used for these skin conditions. Blue light therapy is now being used to treat certain types of skin cancers and it is remarkable. A solution is put onto the skin and then blue light is applied to the cancerous areas. The light penetrates through to the skin, killing the cancerous matter. As discussed before, depending on the severity and exact circumstance of the condition, the treatment’s length and intensity levels differ. These treatments, aside from skin cancer, can be done at home or at a doctor’s office. Red light therapy is commonly used by athletes for pain management. Red light can treat aches and pains, reduce muscle and joint pain, help manage chronic pain, speed up the healing process for a wide array of injuries, and much more. Red light therapy beds, as discussed above, are commonly used for all of these conditions. Body wraps that use red infrared light are used as well and are much easier to fit to your lifestyle. As with all major lifestyle changes regarding your health, it is always important to first consult with a doctor who knows your history. The next step is to choose whether to do the treatments at home or in a doctor’s office. If possible, at-home treatments are usually the best route. Not only are they far less expensive, it is also easier to manage your time around the treatments if you only have to worry about your own schedule. It’s important to choose the right light therapy device. If it doesn’t fit your needs or schedule, you will never use it! And lastly, but most importantly, keep an open mind. Light therapy is a natural form of therapy. If your mind is open and you stick to a schedule, light therapy can seriously be life changing. The treatment will not heal you over night, but if you are dedicated, you can witness wonders. Light therapy is a natural form of therapy that can treat a wide array of conditions and disorders through the power of light. With patience, dedication, and a schedule that fits your lifestyle, light therapy can make you feel at the top of your game at all times! Light therapy can be used to treat mental disorders such as seasonal affective disorder, depression, insomnia, bipolar disorder, jet lag, and more. It is also used to treat physical conditions such as acne, skin rejuvenation, scar healing, chronic pain, joint and muscle pain, wound healing, and so much more. In this article, we are going to discuss how light therapy treats mental disorders. Light can cure your depression?! What?! The main concept of light therapy is using a form of artificial light, such as a light box or lamp, which mimics natural outdoor light. The use of artificial light affects the brains chemicals, such as serotonin, which are linked to mood and sleep. Light therapy also targets the same brain structures that anti-depressants are meant to target. This opens up a whole new world for this all natural, drug-free, harm-free, cost-effective therapy! Light therapy and our biological clock go hand in hand. Our body’s biological clock keeps our body rhythms and sleep-wake cycles in sync with the earth’s light-day cycles. Our biological clock, often referred to as our circadian rhythm, is located in the suprachiasmatic nucleus (SCN) in the hypothalamus, the brain’s hormone control center. It’s controlled by four neurotransmitters – dopamine, norepinephrine, glutamate, and GABA. These neurotransmitters are chemicals that enable function within our brain. When our eyes are exposed to light, this part of our brain is activated and production of melatonin, a sleep hormone, is reduced. Reducing the production of melatonin in our brains allows a stable increase of seratonin, the hormone that keeps us awake and gives us energy. Exposing our eyes to light also releases a wide array of hormones for other mental functions and affects our body’s temperature. We are more linked with the earth than most people would like to believe. Our brains are extremely susceptible to light, the weather, and the natural cycles of the earth. Strangely, we are programmed to cycle naturally every 24.2 hours. However, because we are so linked to the earth’s rhythms and our exposure to light on a daily basis, our cycle changes. We are closely linked to the earth and that’s important to understand first and foremost when it comes to light therapy. Light therapy is used to treat Seasonal Affective Disorder, or SAD, most commonly in the fall and winter months. When the sun begins to set way too early and/or there is very little sunlight throughout the day at all, it is very easy for SAD to creep in and take over your life. Being exposed to bright light for a set amount of time each day can help treat or reduce the symptoms of SAD. Just like Seasonal Affective Disorder, choosing a strict daily light therapy schedule is the best way to see results when it comes to treating or reducing the symptoms of depression. The main goal of light therapy in regards to depression treatment is to reduce the production of melatonin while increasing the production of seratonin. More seratonin = happy mind! The more bright light that is received during the day, especially earlier on in the day, the more likely we are to produce an adequate amount of melatonin at night. More bright light also reduces the brain’s sensitivity to small light exposure in the night time. Light therapy is not a 100% proven treatment for Bipolar Disorder, but it is on the radar and being used by many patients. Since one of the main symptoms of Bipolar Disorder is depression, light therapy is an extremely viable treatment plan. Plus it can reduce patient’s medicinal intake which is great due to the fact that bipolar medications often have awful side effects. Light therapy is a form of all natural therapy that is changing lives around the world. During the basic and most common form of light therapy, patients sit near a special lamp that emits bright light for a set amount of time on a daily schedule. This artificial lighting is meant to mimic natural outdoor light with the goal of affecting the body’s internal clock. Our internal clocks, or circadian rhythms, regulate the way our brains react to energy during the daytime, sleep during the nighttime, and when our bodies become hungry. Melatonin, a sleep hormone, is naturally released in our brains at night when our internal clock is off. Serotonin, our mood altering hormone that provides us with energy, is supposed to be consistently being released throughout the day, while our internal clock is on and active. However, due to factors such as work schedules, seasonal changes, mental disorders, sleeping problems, and more, it is very easy for our circadian rhythms to be thrown off. This is where light therapy saves us! Since our circadian rhythms are greatly influenced by natural every day environmental factors such as the sunrise and sunset, light therapy is a wonderful way to make sure our bodies are releasing melatonin and serotonin at the correct times. Doing so can treat mental disorders such as depression and seasonal affective disorder, increase energy and happiness levels, improve skin conditions, and so much more! As with any medical practice, there is a long list of myths that follow light therapy around. We’re here to share some myths with you and provide you with the facts. Let’s get down to it. While we’ve been noting light therapy for mental conditions in this article, there are many different forms of light therapy. Aside from standard bright light treatments, there are also red, blue, and green light therapy devices. These devices can treat skin conditions such as psoriasis and acne. They are also wildly successful at rejuvenating the skin, reducing wrinkles and fine lines, and making you feel like your sixteen year old self again! Red light is also used for muscle and joint pain, wound healing, chronic pain, and more. Don’t stop at bright light, all of the colors are wonderful! It’s true, light therapy is most commonly used to treat Seasonal Affective Disorder and other forms of depression. However, light therapy has endless potential for our mental and emotional well being. It can also treat sleep disorders, dementia, bipolar disorder, jet lag, and more. Assuming that light therapy is only good for one thing is just silly! Myth #3: So I Just Stare Into A Light Bulb For Hours? Wrong! It’s easy to assume that light therapy treatments consist of sitting in front of light bulbs and waiting for the magic to happen. But in actuality, treatment sessions typically don’t last longer than 30 minutes a day. The sessions are easy to fit into your daily routine and most devices allow you to do other activities to pass the time or multitask. 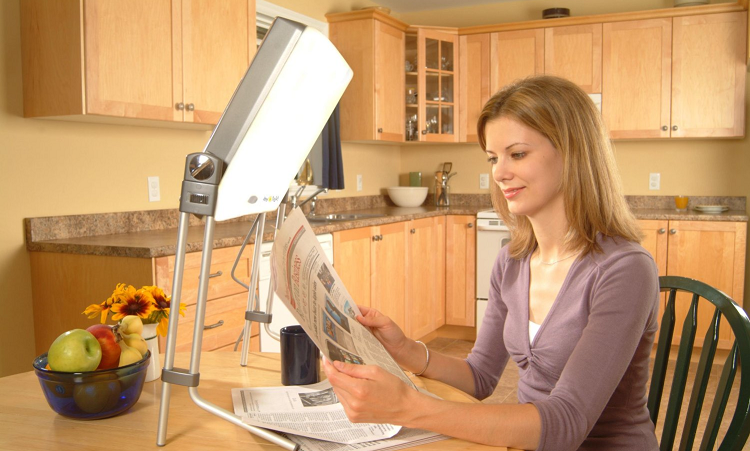 Try reading a book, knitting, or eating a meal while sitting in front of your light therapy device! Also, you wouldn’t stare into the light – so take note of that. A light therapy device usually emits light that is 100 times brighter than most indoor lighting, since the treatments are intense and succinct, so you definitely don’t want to be staring into that bulb! Myth #4: There Are No Side Effects! It’s easy to make assumptions about things that are not normal or common. Light therapy is a world changing treatment that deserves all of the praise and credit you can give it! Make no assumptions about light therapy, don’t believe the myths, and know your facts. If you follow these words, you will end up thanking us! We promise.